Alex Liburd scored for the home side against a Blue Cross reply via Lui Sarrington - his side are still looking for their first away win. Missing the chance to take advantage of this United slip up and go back onto the top of the table were Wilstead who were beaten 5-0 at Kempston Rovers Development. Patrick Asare with a brace plus strikes from Sam Smith, Kye Andrews and Yassin Bruma brought up the Rovers nap hand. All of which was good news for Flitwick Town who, after starting the day in fifth, ended it in second after winning 7-1 at Caldecote to end the home club’s 100% home record and eight game winning run to see them drop in the table from third spot into sixth place. Will Scutt with a hat-trick was joined on the Town scoresheet by Daniel Stafford, Ian Buckingham, Phil Matthews and Joe O’Donnell against a lone home reply via Jack Boyd. Now in fourth are AFC Kempston Town & Bedford College who took their home winning ways up to four games with a 2-1 victory over Cranfield United. Courtney Boughton and a penalty from Perry Ronayne marked their scoresheet against a lone United reply via Martin Holland. Also climbing the table and now in fifth are Shefford Town & Campton who ended a three game losing away run by winning 2-1 at AFC Oakley M&DH thanks to goals from Ryan Lewis and Kier Boyd against a home reply via Ali Smith. Elsewhere Stevington took their unbeaten run to five games by winning 2-1 at Marston Shelton Rovers who, with results elsewhere, now find themselves in the relegation zone. Kieran Souter and Jordan Wright scored the vital goals against a lone Rovers reply from Dale Malciw. Whilst Ampthill Town Reserves were 2-0 home winners over Sharnbrook thanks to goals from Scott Gadsden and Jake Webster. Now back onto the top of the Division One supported by Wests Citroen Bedford are Crawley Green who extended their unbeaten ways up to 10 games when sharing the spoils in a 0-0 draw at the yet to win and bottom of the table Old Bradwell United Reserves. The Green are back at the summit on goal difference only after Queens Park Crescents lost their unbeaten ways and 100% home record when beaten 4-2 by Cople & Bedford SA. Two successful spot kicks from Pail Nigro were added to by goals from Ollie Hughes and Gary Canzano for the visitors against Crescents replies from Sundeep Gill and Shahinur Rahman. However, missing the chance to top both of these sides were Meltis Albion whose 100% home record was blown away by a Elstow Abbey side winning for the first time in 10 starts with a 4-2 victory. Joe Cooper, Harry Ellis, Billy Mills and an own goal marked the Abbey scoresheet against a brace in reply from Carl Townsend. The shine on Abbey’s victory was taken away sightly following a red card for Lucas Banton. Now in fourth are Totternoe Reserves who chalked up their fifth away win when winning 3-0 at Westoning thanks to a Joe Smith hat-trick. There was also joy on the road for M&DH Clapham Sports who won 2-1 at Shefford Town & Campton Reserves to end the home side’s three game winning run. Sam Maddix and Marko Tobzic secured the vital goals against a penalty reply from Josh Goor. The biggest winners of the day were AFC Kempston Town & Bedford College Reserves who went nap with a 5-1 home victory over The 61 FC Luton Reserves. Kegan Roberts with a brace was joined on the scoresheet by Anas Beckhoum, Ryan Smith and Ashley Windridge against a lone reply from Calum Doherty. The lone game of the day saw AFC Oakley M&DH Reserves claim their first victory in six outings when winning 2-1 at Sundon Park Rovers thanks to goals from Justin Muircraft and Dan Glos against a lone Rovers reply via Shane Roberts. Wilstead Reserves’ lead at the head of Division Three is now up to seven points after they retained their unbeaten home ways with a 4-1 victory over Shefford Town & Campton A.
Liam Philip led the way with a hat-trick and were joined on the scoresheet by Robert Booth against a lone Town reply via Marcia Bator. Whilst now in third spot are Marston Shelton Rovers Reserves who ran out 9-2 winners over Kempston Athletic. Gary Russon netted four times, Lewis Steele twice alongside single goals from Matt Jarman, Carl Borromeo and Kieran Day against Athletic replies via Gary Whitbread and James Maxwell. Still very much in the promotion race are Bedford Albion who took their unbeaten ways up to five games by winning 6-1 at White Eagles. Paul Babbington scored a hat-trick, Jack Brown a brace and Daniel Jeffries once against a lone Eagles reply from Wojciech Plizga. Clifton moved to within goal difference of league leaders CS Rovers after they retained their 100% away record and took their unbeaten ways up to seven games when winning 5-0 at Dinamo Flitwick. George MacMillen with a hat-trick was joined on the scoresheet by Gavin Stackeman and James Bennett to bring up the nap hand. Whilst there was a first home win of the season for Flitwick Town A the 4-2 winners over AFC Kempston Town & Bedford College A. David Lyons netting three times and Stuart Kemp once against College replies via John Hislop and Martin Smith. Elsewhere there was back to back wins for the first time this season for Sandy Reserves who went nap with a 5-0 home victory over bottom of the table Lidlington United Sports. Steven Wilson led the way with a hat-trick and joined on the scoresheet by Andy Barker and Nathan Morris. 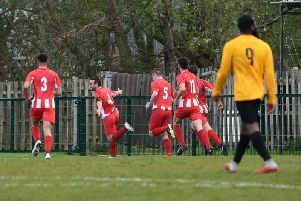 Whilst Harlington returned to winning ways for the first time in eight outings when winning 4-1 at Stevington Reserves. Farrell Whitman with a brace was joined on the scoresheet by Ben Whalley and Shea Gentle-King against a lone reply from Jamie Endersby. Michael France a brace and joined on the scoresheet by single strikes from Tom O’Neill and Rajan Nandna. Also seeing off opposition from the Luton District and South Beds League with home wins were Cranfield United Reserves and Flitwick Town Reserves. United with two goals from Adam Kerr plus single strikes from Adam Constable and Jack Sharm 4-0 winners over FC Polonia Luton and the Town 3-1 winners over Christians in Sports Reserves with goals from Liam Kearne, Benn Ward and Jamie Smith. The Luton League’s only survivors going into the hat for the quarter-final draw being FC Koran who won a 4-3 penalty shoot-out at Wixams after 90 minutes play had seen the sides deadlocked at 3-3. Gareth White with a brace plus Jonny Cockram were the Wixams goalscorers. Meantime there was joy and sorrow for Caldecote. The Reserves had just a goal from Jake Bruce to show for their 3-1 defeat at Riseley Sports for whom Sam Harrison, James Cooke and Mitchell Crook netted. Whilst the A team were 4-0 home winners over Wootton Village. Tony Norman with a brace was joined on the scoresheet by Neil Giles and Gary Allum. Perhaps the result of the day belonged to Henlow Reserves, 3-0 home winners over Sandy Albion. Daniel Wilson fired them ahead just two minutes from the break before Jonathan Whitehead doubled their lead 13 minutes into the second period to allow Jonathan Rowe to add icing to the cake with a third goal just four minutes from time. Elsewhere Potton Town were 3-2 home winners over CS Rovers. An own goal plus a brace from Chris Moore only being replied to twice by Rovers Connor Darocha.